According to NADRA (North American Deck and Railing Association) there were 30 deaths between 2000 and 2006 from deck failures. It is also estimated that here are over 40,000 decks in need of replacement or repair in this country. With numbers like that I thought it was important to talk about some common mistakes that people make when constructing decks. Building decks has become a very popular DIY project for homeowners trying to save some money while sprucing up their backyards. Building safe decks doesn’t have to be all that difficult or complicated as long as you take the time to plan your project. 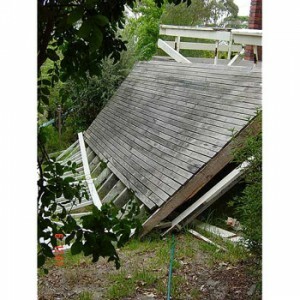 Most deck failures can be avoided by simply following standard deck construction details. Insufficient Deck Ledger Connection – According to a recent report on deck failures, 90% of deck failures are due to poor deck ledger board connections. Simply nailing a deck ledger to the house is far from adequate yet it’s the most commonly found ledger connection that I see. Deck ledgers must be bolted or lagged to the house in order to develop sufficient structural capacity. Again I recommend seeking advice from a local building code official or your local lumber yard. Improper Foundations – Decks must be built on suitable foundations capable of supporting the load and accomodating environemental forces such as temperature, snow, ice and wind. It’s very important to install footings to the proper depth on structurally sound materials. Insufficient Railings & Stairs – This is probably one of the most common deck mistakes that I see. Railings must be structurally sound and geometrically acceptable according to local building codes. Stairs must meet building codes for width, rise and run requirements. Joist and Beam Capacity – Many decks have structural members that are undersized. It is extremely important to have properly sized joists and beams based on the proposed deck loading. If you’re not familiar with recommended framing member sizes then I recommend you seek some assistance from your local building supplier or your local building code official. I also recommend you visit the NADRA website for deck ideas and information about qualified contractors in your area. I also highly recommend you pull the proper building permits and ask for guidance from you local building code officials. Just remember that decks can be quite dangerous if they are not constructed properly. Excellent post! I find that many people in an effort to save on cost not only do the work themselves and are not really capable, but they also take shortcuts and do not thoroughly research the project. If you are going to do a job for the first time you really need to get as much information as possible. Improper installation in many cases is not only dangerous it can have deadly results. There is plenty of good information out there in articles like this one all over the internet. This is one to common area that I have encountered when people try to make their own decks and aren’t familiar with construction methods. I also have seen people try to use a less dimensional lumber size than required which can lead to problems. One aspect that I have found is the improper anchoring into the home, it seems to be the biggest issue around my area. Many DIY’ers don’t realize that many home centers will offer a design service free of charge and provide a list of recommended materials that usually will take care of these issues.